August 7, 2017 The winners scored the only run of the game in the top of the fifth after failing to advance the lead off hitter and without getting a hit. Gastelum, who reached on a fielders choice after not handling a sacrifice bunt, made it to home plate thanks to a groundout, a passed ball and a wild pitch. Mexico lefthander Juan Hernandez pitched a gem: he went the distance (75 pitches, 50 strikes) for the shut out, allowing only 5 hits and no walks. It was a classic pitching duel, quite a rare occurrance in the tournament, for the first 4 innings. 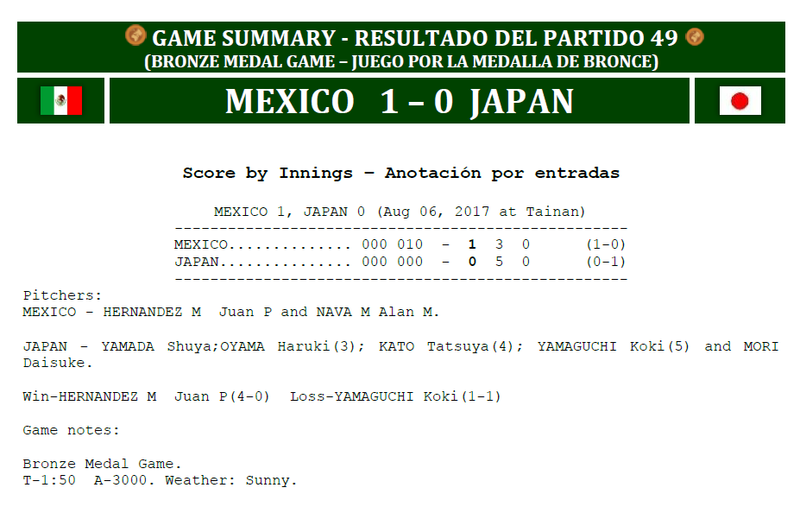 Mexico left hander Juan Hernandez allowed 4 hits, 2 in the first inning, when rightfielder Toi reached second with 2 outs. 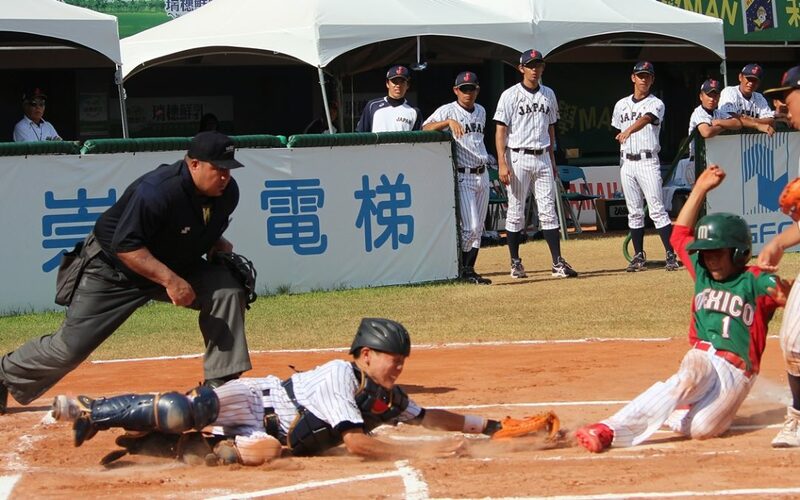 Also second baseman Otawa got in scoring position with a lead off double in the second. A combination of 3 Samurai pitcher (Shuya Yamada allowed a hit and 2 walks in 2 innings, Haruki Oyama allowed a hit and a walk in one, Tatsuya Kato pitched one inning and allowed a hit) escaped a few jams. Mexico loaded the bases with 2 outs in the first and had runners on second and third (again 2 outs) in the third. They also put the potential go ahead run at second (right fielder Saldana, double) with one out in the fourth, but on Fornue line to right field, Saldana was doubled up on at second an appeal play. Japan middle infield (Otawa and shortstop Tokunaga) provided fan favorite plays. An Outfielder Reiji TOI of Japan was awarded Leading Hitter (.786) as well as a World Team Member.